she holds a position of supreme importance, for is she not directly and intimately concerned with the nurturing and upbringing of the children of the family, the future generation? She is their first counsellor, and teacher; on her rests the responsibility of implanting in the flexible minds of her young, the right principles and teachings of modern civilisaÂ­tion. Indeed, on her rests the failure or success of her children when they go out into life. It is therefore essential that the home atmosÂ­phere be right, that the mother be the real "queen" of the home, the inspiration of her family, if her children are to go out into the world equipped for the battles of life. There are many problems pressing in upon us Bantu, to disturb the peaceful working of our homes. One of the chief is perhaps the stream of Native life into the towns. Men leave their homes, and go into big towns like Johannesburg, where they get a glimpse of a life such as they had never dreamed existed. At the end of their term of employment they receive the wages for which they have worked hard, and which should be used for the sustenance of their families, but the attractive luxuries of civilisation are in many instances too much for them, they waste their hard earned wages, and seem to forget completely the crying need of their family out in the veld. The wife finds that her husband has apparently forgotten her existence, and she therefore makes her hard and weary way to the town in search of him. When she gets there, and starts looking round for a house of some sort in which to accommodate herself and her children, she meets with the first rebuff. The Location Superintendent informs her that she cannot rent accommodation unless she has a husband. Thus she is driven to the first step on the downward path, for if she would have a roof to cover her children's heads a husband must be found, and so we get these poor women forced by circumstances to consort with men in order to provide shelter for their families. Thus we see that the authorities in enforcing the restrictions in regard to accommodation are often doing Bantu society a grievous harm, for they are forcing its womanhood, its wedded womanÂ­hood, to the first step on the downward path of sin and crime. Many Bantu women live in the cities at a great price, the price of their children;for these women, even when they live with their husbands, are forced in most cases to go out and work, to bring sufficient into the homes to keep their children alive. The children of these unfortunate people therefore run wild, and as there are not sufficient schools to house them, it is easy for them to live an aimless existence, learning crime of all sorts in their infancy almost. If these circumstances obtain when husband and wife live together in the towns, imagine the case of the woman, whose husband has gone to town and left her, forgetting apparently all his responsibilities. Here we get young women, the flower of the youth of the Bantu, going up to towns in search of their husbands, and as I have already stated, living as the reputed wives of other men, because of the location requirements, or becoming houseÂ­keepers to men in the locations and towns, and eventually their nominal wives. In Johannesburg, and other large towns, the male Natives are employed to do domestic work, in the majority of instances, and a female domestic servant is a rarity. We thus have a very dangerous environment existing for any woman who goes into any kind of domestic service in these towns, and naturally immorality of various kinds ensues, as the inevitable outcome of this situation. Thus we see that the European is by his treatment of the Native in these ways which I have menÂ­tioned, only pushing him further and further down in the social scale, forgetting that it was he and his kind who brought these conditions about in South Africa, forgetting his responsibilities to those who labour for him and to whom he introduced the benefits, and evils, of civilisation. These facts do not sound very pleasant I know, but this Conference is, according to my belief, intended to give us all the opportunity of expressing our views, our problems, and of discussing them in an attitude of friendliness and fairmindedness, so that we may perhaps be enabled to see some way out of them. Then we come to the Land Question. This is very acute in South Africa, especially from the Bantu point of view. South Africa in terms of available land is shrinking daily owing to increased population, and to many other economic and climatic causes. Cattle diseases have crept into the country, ruining many a stock farmer, and thus Bantu wealth is gradually decaying. As a result there are more and more workers making their way to the towns and cities such as Johannesburg to earn a living. And what a living! The majority earn about £3 10s. per month, out of which they must pay 25s. for rent, and 10s. for tram fares, so I leave you to imagine what sort of existence they lead on the remainder. Here again we come back to the same old problem that I outlined before,””that of the woman of the home being obliged to find work in order to supplement her husband's wages, with the children growing up undisciplined and uncared for, and the natural following rapid decay of morality among the people. We find that in this state of affairs, the woman in despair very often decides that she cannot leave her children thus uncared for, and she therefore throws up her employment in order to care for them, but is naturally forced into some form of home industry, which, as there is very little choice for her in this direction, more often than not takes the form of the brewing and selling of Skokiaan. Thus the woman starts on a career of crime for herself and her children, a career which often takes her and her children right down the depths of immorality and misery. The woman, poor unfortunate victim of circumstances, goes to prison, and the children are left even more desolate than when their mother left them to earn her living. Again they are uncared for, undisciplined, no-one's responsibility, the prey of the undesirables with whom their mother has come into contact in her frantic endeavour to provide for them by selling skokiaan. The children thus become decadent, never having had a chance in life. About ten years ago, there was talk of Industrial schools being started for such unfortunate children, but it was only talk, and we are to-day in the same position, aggravated by the increased numbers steadily streaming in from the rural areas, all underÂ­going very similar experiences to those I have just outlined. I would suggest that there might be a conference of Native and European women, where we could get to understand each others point of view, each others difficulties and problems, and where, actuated by the real spirit of love, we might find some basis on which we could work for the common good of European and Bantu womanhood. Many of the Bantu feel and rightly too that the laws of the land are not made for Black and White alike. Take the question of permits for the right to look for work. To look for work, mark you! The poor unfortunate Native, fresh from the country does not know of these rules and regulations, naturally breaks them and is thrown into prison; or if he does happen to know the regulations and obtains a pass for six days, and is obliged to renew it several times, as is of course very often the case, he will find that when he turns up for the third or fourth time for the renewal of his permit, he is put into prison, because he has been unsuccessful in obtaining work. And not only do the Bantu feel that the law for the White and the Black is not similar, but we even find some of them convinced that there are two Gods, one for the White and one for the Black. I had an instance of this in an old Native woman who had suffered much, and could not be convinced that the same God watched over and cared for us all, but felt that the God who gave the Europeans their life of comparative comfort and ease, could not possibly be the same God who allowed his poor Bantu to suffer so. As another instance of the inequalities existing in our social scheme, we have the fact of Natives not being allowed to travel on buses and trams in many towns, except those specially designed for them. 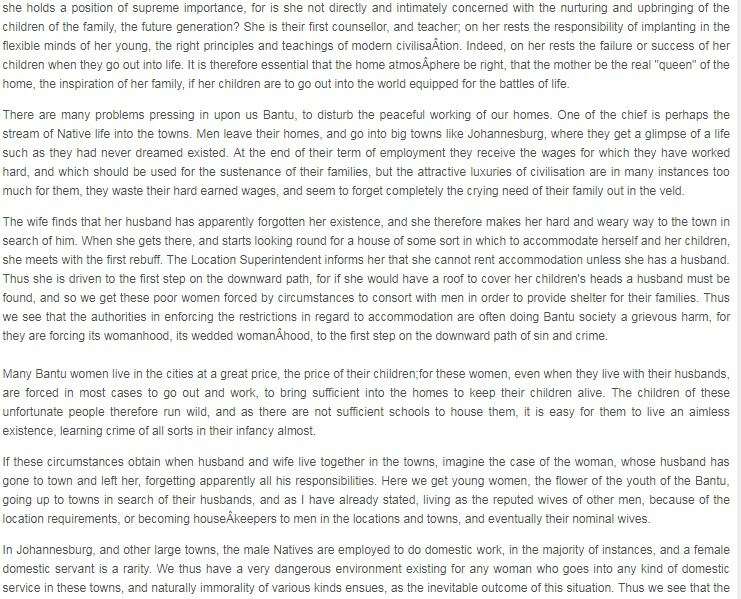 In connection with the difficulty experienced through men being employed almost exclusively in domestic work in the cities, I would mention that this is of course one of the chief reasons for young women, who should rightly be doing that work, going rapidly down in the social life of the comÂ­munity; and it is here that joint service councils of Bantu and White women would be able to do so much for the good of the community. The solution to the problem seems to me to be to get women into service, and to give them proper accommodation, where they know they are safe. Provide hostels, and club-rooms, and rest rooms for these domestic servants, where they may spend their leisure hours, and I think you will find the problem of the employment of female domestic servants will solve itself, and that a better and happier condition of life will come into being for the Bantu. If you definitely and earnestly set out to lift women and children up in the social life of the Bantu, you will find the men will benefit, and thus the whole community, both White and Black. Johannesburg is, to my knowledge, a great example of endeavour for the uplift of the Bantu woman, but we must put all our energies into this task if we would succeed. What we want is more co-operation and friendship between the two races, and more definite display of real Christianity to help us in the solving of these riddles. Let us try to make our Christianity practical.